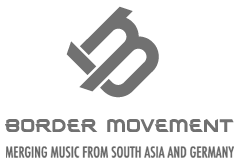 Border Movement: Electronic Music Workshop will be the most educational and advanced workshop done so far with three highly experienced and knowledgable guest instructors from India, Morocco and Germany. 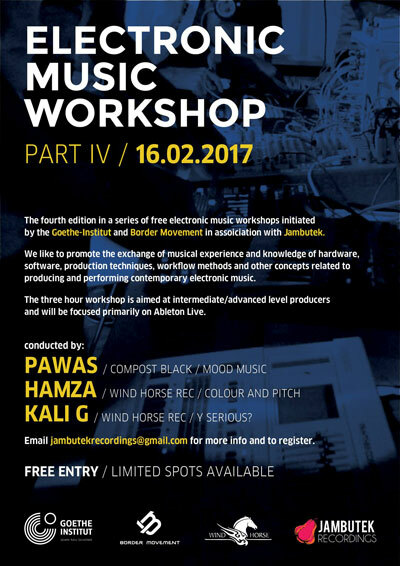 Each featured producer/lecturer will give a 45 minute presentation on their own unique workflow method, production style, favourite techniques, useful tips etc. Each presentation will be followed by a few minutes of Q&A from the audience. The presentations will use both projection of the software being used as well as audio examples from the PA.
Jambutek will provide/source all production/music related equipment for the guest instructors to demonstrate with. Any additional time can be used for further Q&A or a listening session.